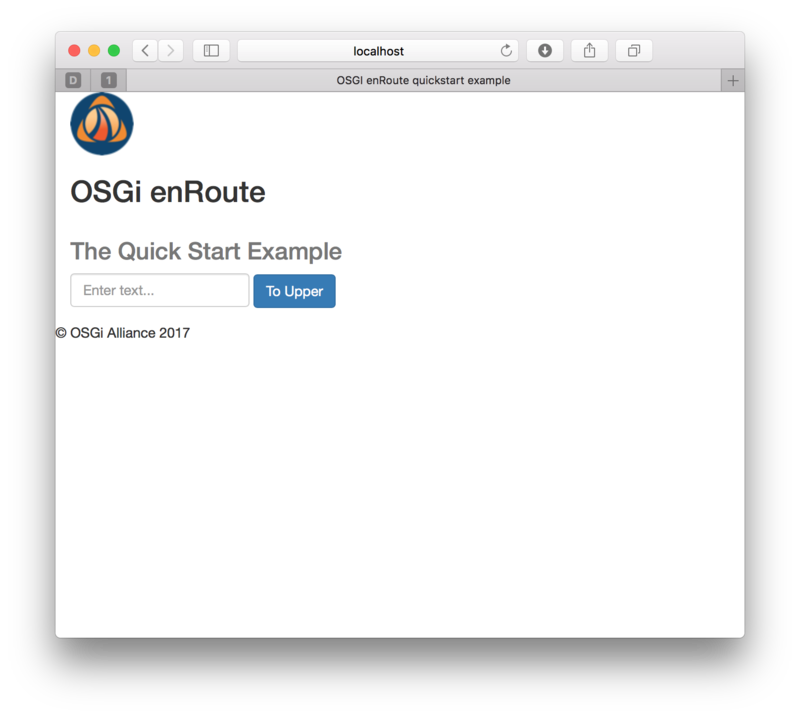 In this tutorial we’ll first run, and then re-create and re-run, a simple OSGi Microservice. 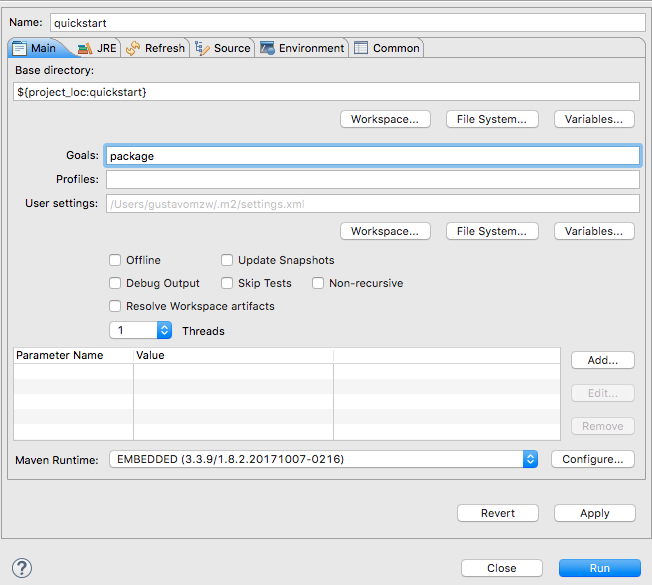 We start by first downloading, building and running the enRoute quick start example. In addition to demonstrating the simple application this will also confirm that your local environment meets the required prerequisites. Download the enroute examples from GitHub and change directory into examples/quickstart. If you’re using a Java version higher than 8 to run this tutorial then you’ll need to set the appropriate runee in the examples/quickstart/app/app.bndrun and then resolve the application. For Java 9 use JavaSE-9, for Java 10 use JavaSE-10 and for Java 11 use JavaSE-11. Once you have made this edit issue the command mvn bnd-indexer:index bnd-indexer:index@test-index bnd-resolver:resolve to generate the index, test index, and resolve the bndrun (you should be able to see the changes in the runbundles list afterwards). Once you’ve done this the first time then you can mvn verify to your heart’s content. or if minimalism is more your thing, the raw REST endpoint http://localhost:8080/rest/upper/lower. When you want to terminate the application press Ctrl+C. We’ll now recreate the quick start example locally as though it were your own greenfield OSGi project. It is assumed that you have the required environment installed on your laptop. Make sure the newly recreated project is not in the previous examples/quickstart directory structure, as it will also be named quickstart. Feel free to put it in the same parent directory as the downloaded examples/quickstart project or make a new directory outside the downloaded examples/quickstart project. For this tutorial, we put the newly created project in the ~ (AKA /home/user) directory. If you put your project in a different directory, be sure to replace the ~ with your directory path when it appears in shell snippets in the tutorial. We declare to use the version 3.0.1 of the maven-archetype-plugin because if the version is not fixed, Maven chooses the version and it does not work with e.g. version 2.4. If you’re using an IDE then this would be a good time to import the generated maven projects. A JAX-RS resource method implementation, replacing the the TODO section. The @Component is modified to register this component as an OSGi service. The @JaxrsResource annotation is used to mark this as a JAX-RS whiteboard resource. It’s now time to build the implementation project. From the ~/quickstart/impl project we now build the impl bundle. Here, we use the package goal to check that the code compiles and can be successfully packaged into a bundle. If we had tests or other post-packaging checks then we could have used the verify goal instead. If the package fails then check your code and try again. Once you can package it cleanly then continue to the next stage. When using Bndtools your IDE will be incrementally rebuilding your projects every time that you save, so there’s no need to run a build. You can also run a build manually. As shown, the bndrun contains a runrequires statement that specifies a capability; i.e. the implementation for quickstart. However, no runbundles a currently listed; i.e. 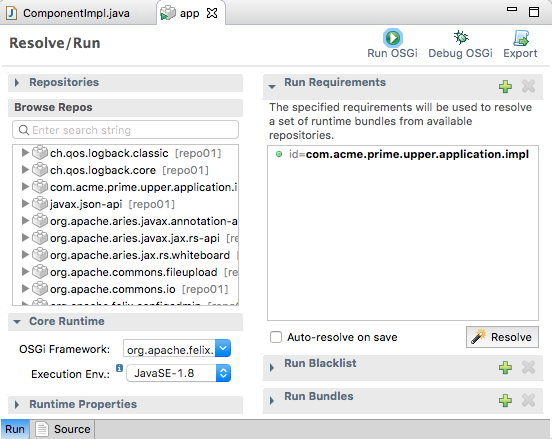 the actual bundles needed at runtime to create quickstart. The runbundles are automatically calculated for us via the process of resolving. In the app maven module, open the app.bndrun to display the Bndtools Resolve screen. Here we can see that the implementation bundle is added to the run requirements. Note that Bndtools automatically keeps your indexes up to date, so there is no need to manually generate them. 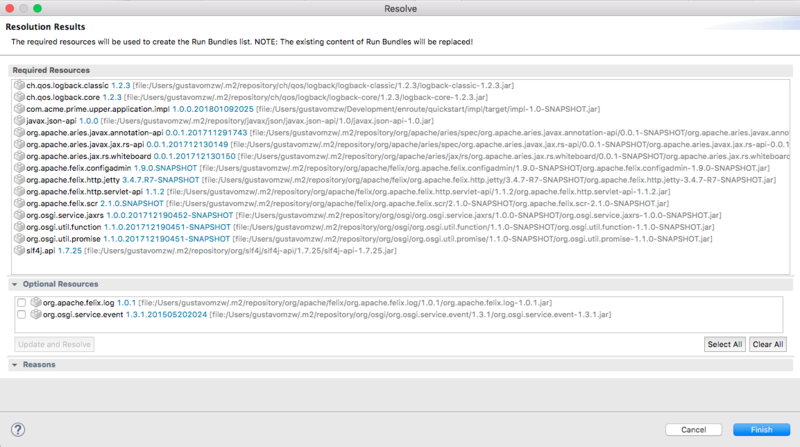 If you look again at the app.bndrun file you will now see that our rest service implementation org.osgi.enroute.examples.quickstart.impl, OSGi Declarative Services implementation org.apache.felix.scr, and a number of other bundles required at runtime are now listed by runbundles. We now create a runnable application JAR. Note that in this version of quickstart only the REST endpoint will be available. Now that the initial development is done we’re ready to build and package the whole application by running the following command in the project root. Your version of quickstart may now be started as described above. It won’t have a UI, but the REST endpoint will be available at http://localhost:8080/rest/upper/lower. See the results in the console screen. Wait for maven to finish the generation. The runnable jar file created will be app/target/app.jar, and may be started as described above. It won’t have a UI, but the REST endpoint will be available at http://localhost:8080/rest/upper/lower.